Never mind newbies, this stuff is intimidating for us experienced RC helicopter "guys & gals" who have been using mechanical CCPM mixing and flybars for years. This is probably why I get at least one email question every day on the topic of 120/140 swash setup & flybarless configuration/tuning from people looking for help. 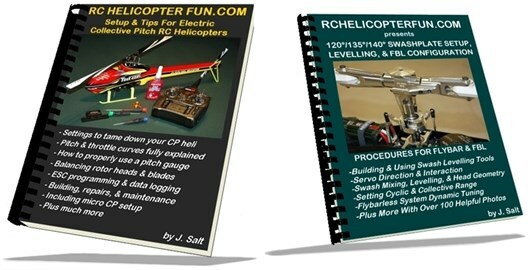 Many of my customers that purchase this eBook are simply tired and frustrated having to ask someone else to get their servos centered, interacting correctly, and swashplate levelled on their helicopter/s. If you are always dependent on someone else for swash setup, it really takes the joy out of the hobby; never mind missing out on the wonderful feeling of accomplishment once you fully understand the process as you strive for setup perfection. 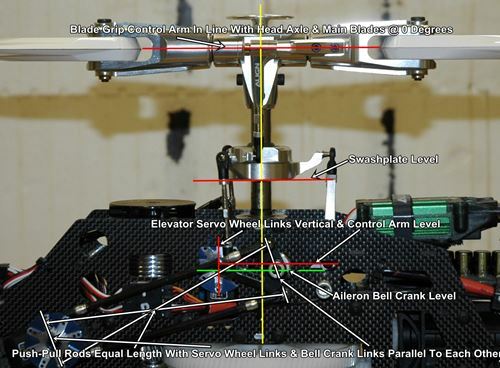 There really isn't much info covering all the aspects of proper and correct CCPM swashplate setup from servo interaction and direction, levelling tools, setting collective and cyclic range, differences in flybarless vs flybar setup etc. all rolled into one (hopefully easy to understand and follow) guide. This is a big topic after all, and why I felt it so important to write an eBook on the subject to help you understand what it's all about by showing a logical step by step process with over 100 photos to help out with the explanations. As with my other eBooks, I'm not going to bore or insult you with a endless sales pitch. I will show you what's in the swashplate setup eBook by way of excerpts taken from the eBook, the table of contents, ordering information, and some testimonials at the bottom of the page. 1. You have built your RC helicopter correctly and have used the recommended servo & swashplate pushrod measurements from the instructions to get your swash in the “ball park” or at least playing in the same city. If you have a RTF, or used heli that came all built, the pushrod lengths should be good; it wouldn’t hurt to double check them though. 2. You have a computerized radio with RC heli software that supports the type of CCPM swashplate (120 or 140) that your heli uses. 4. You know how to use a RC helicopter pitch gauge. The second and less known tool is called a swashplate levelling tool. You can build your own (we will get to that in Chapter 3) or purchase one. Finish up by rechecking all interactions to make sure the swash is moving in all directions correctly. Congrats – you just completed the most difficult part of swashplate set up as far as I am concerned (getting the servo direction and interactions setup correctly), levelling the swashplate will be child’s play. Don’t worry – this one is easy with the help of our trusty computerized radio – specifically the servo travel limit screen. Right now you have a swashplate levelled at mid stick, the question is will it stay level at minimum and maximum pitch values? Give it a try, move the collective stick on the radio to full low and see if the swashplate is still level. Now try moving to full high, again is it still level? In both cases the answer is most likely NO! If there is one question that keeps popping up almost daily in my in-box, it's "Why don't you write a flybarless setup eBook? If you did, I would be first in line for it". for your particular FBL system." Not very helpful - right... I fully understand there is a big gap out there right now in the actual understanding of FBL systems and how they work. Configuring the easy to set installation parameters that we have already gone over in the eBook is the easy part of it; getting the dynamic tuning correctly set is the hard part, but it doesn't have to be. 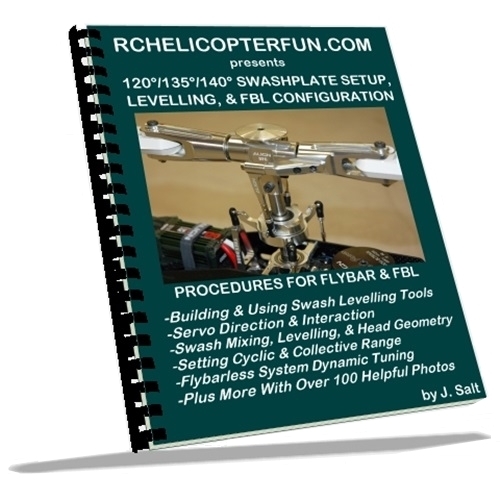 This RC helicopter "120/135/140 Swashplate Setup, Levelling & FBL Configuration" eBook is offered in PDF format only (no hard copies are available). If you don't have a PDF reader you can download one for free from Adobe. There are also PDF Apps available for tablets and smart phones if that is how to wish to view the eBook. TO ORDER, simply click the BUY NOW button below to be reading your own copy of the 120/135/140 Swashplate Setup, Levelling, & FBL Configuration eBook within minutes. Payment can be made with any major credit card or through PayPal. 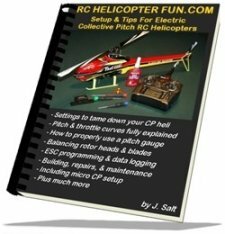 Are you also interested in my Setup & Tips For Collective Pitch RC Helicopters eBook? Have fun setting, levelling, & tuning! 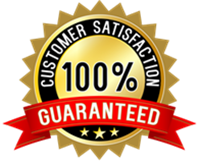 Hello John, I normally don't leave feedback, but after getting your swashplate ebook a week or so ago, I thought I should let you know how much I have enjoyed it and how much it has helped me out. I've actually been flying helicopters for almost as long as you have and consider myself a good pilot and knowledgeable. I still however was having a hard time with flybarless setup, or as you like to call it configuration & tuning. I kept running across your web site & swash ebook while searching for FBL information and figured for only $11 bucks, it was worth a try. I know you are an honest person going by the kudos you get on the RC forums, so I figured even if I didn't like the ebook, you would refund the purchase. No refund request here! In fact, I think you could be asking a fair amount more for this ebook. You have a gift for explaining technical subjects and you shouldn't sell yourself short with that skill. I even learned a few basic swashplate tips I was not aware of before, but all your flybarless procedures are what I was most impressed with. I went through my SAB Goblin 630, tweaked a few mechanical settings, and experimented with the gains and some other fields. Like you, I really like the Bavarian Demon 3X and it was flying well before, but now that I understand what I'm doing and what some of the settings do - it's flying so much better. I can't wait to apply my new found knowledge to my Goblin 770. As others have said, you are a real credit to our hobby. Thanks again for the help. THANK YOU! Your work has made me a "neighborhood expert". I have been chewing on your E-books for quite a while now. I have treated them more like a handbook than a text book because the layout is so clear and logical: not pedantic or written in Chinglish. I have been able to enjoy the hobby SO MUCH MORE since acquiring your books! Today I flew my Mini Titan that I had just completely rebuilt since crashing it quite badly last weekend! Because of your books, I am certain, the bird flies better now than it has ever flown in my hands! The whole project was a relative snap with your books on hand on my laptop next to the repair bench! I knew methodologies and tools and procedures that only a sparse few of my acquaintances in RC had any idea about... THANKS TO YOU, Sir! (Swashplate leveling tool, for instance; my buddies have all been just eye-balling the rigging and wondering why they fight with trim all the time). Hi John, I recently purchased your ebook on swash setup leveling and fbl tuning. I wanted to thank you for a very informative, practical and very useful book. I am still flying my old blade4003D but upgraded to a DX9 radio. I replaced all the servos, new gyro and basically re-built the heli so I needed to set it up from scratch. I followed your guidance and advice and it just made the whole process so easy. First flight and it was 99% spot on with very minor tweaks needed. Thank you. Dear John, Your e-book on swashplate setup and leveling is easily worth twice the price because after following your simple directions I transformed my collective pitch demon into a rotor angel in about an hour. It's like flying a totally different helo! You saved me months of time and untold frustrations, and I can't thank you enough. I surely would have given up on this hobby without you! Keep up the great work! Hi John, just a quick thank you. 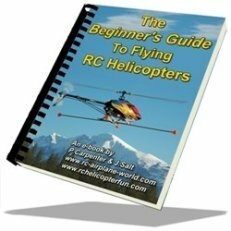 Your beginners guide and website got me into RC helicopters and the setup & tips e-book is great but the best after building a Trex 450 sport and finding it hard to setup, was your swashplate setup and leveling book. After setting it up, I took it out the garden and apart from having to reverse the rudder on my dx6i it went straight into a stable hover without any trim at all, not bad for a novice! Once again thank you very much and keep up the good work. Hi John, I MUST write you and say a big thank you for uncloaking the 'black-art' of swashplate setup! My little 400 electric had sat unloved and gathering dust after I gave up trying to unravel the secrets of setting up CCPM. I purchased your e-book last week and firstly enjoyed reading it through before starting work. Well, your e-book is so methodical, easy to follow, and correct that I almost started asking myself WHY had I not persevered with this before... simple answer is that despite searching the web, reading my radio manual and the heli instruction book, nothing has come close to your e-book. I have since purchased your other 2 e-publications and am enthused by the setup and tips for 400 series heli's. Just wanted you to know that I thoroughly enjoyed reading your Swashplate Setup & Leveling guide Ebook. I'm a "do-it-yourself" kinda guy that has recently taken interest in this wonderful and exciting hobby and what I love about your Ebook is that I never had any difficulty comprehending what you are trying to teach in your material. Most books either give you too vague/little or too much information, but yours totally hit the sweet spot for me. Lots of information to arouse interest, but just enough to keep a beginner like me engaged in the learning process. Thanks for your Ebook! A good buy and highly recommended! When I got started, I crashed a lot and was about to give up until I found your website. Your Flight School is fantastic. Buying the setup & swashplate setup leveling e-books has given me a lot of insight into what IT was that I was missing. My model flies very well now, even after several crashes because I now know what to do to get the setup right. Since I started following your Flight school, I have only crashed once, and that was because I got too giddy and forgot to set the timer... Keep up your Brilliant work, I certainly appreciate it, and I'm sure many others do. Hi john I purchased the two of your ebooks - setup tips & swashplate setup & leveling. Being new to the hobby, I was amazed at the amount of info you are generally not told when buying a kit. I managed initially to lift my heli with no swash mix etc. but bent my flybar and got my thumb nail zapped. After reading the ebooks I feel i have gained a wealth of info that nobody else wanted to part with. In the three weeks I have been setting up my heli and reconfiguring the swash etc. based on your ebooks I feel like a pro already. Once again, thank you for the well put together literature. I don't know how I missed your e-book on swashplate setup but I purchased it last night. This is the book I've been looking for. Within 30 minuets of reading then applying what I learned, my scale Hughes 500C flew for the first time, a nice stable hover and the motor never went above 120 deg F despite having 4 blades to swing. You need to write more books like this. At the next club meeting this one will cause quite a lot of interest. Thanks again! I bought your book on swashplate setup and like the rest of your books learned more from it then any other place. Now when my new TRex 600 arrives I just hope I can put the reading to doing and correctly. Your book and the way you explain at least finally gives me a good chance. I must admit before I did not think I stood a chance of doing it correctly but the book makes it understandable and actually makes sense of it all. I am still somewhat unsure of radio settings but when I reach that point I may be turning to you for some extra advice. I had already ordered that Trueblood engineering leveller as all my research led me to that as being the best so it was at least reassuring that it was the one you recommended. A great book John and $10 well spent. Hi John, Congratulations! You have done it again! Swashplate setup has been a major topic for me over the last 2 weeks and has seen me scratching my head on many an evening. I bought your latest book on Friday and my problems are solved (well, almost all of my problems). I really must say that you have a knack to present difficult topics in a clear and understandable manner. To date (of all the documents I have read in respect of rc cars and helis - any there are/were many) the original book and the new one are by far the best and informative. My Raptor's setup instructions on the swashplate is contained in one paragraph. I gave it one look and thought "what?" together with some non-printable other thoughts. At least I now know that I will get that part right. Hi John, Just got your swashplate setup book and wanted to say THANK YOU! I have your Setup & Tips book and got so much out it but was really trying to find out how to setup my swash plate after I had to replace a servo gear. I couldn't find the info anywhere and really made a mess of things. My LHS fared no better I am afraid and I think I should tell them about your e-book! Your excellent writing style and easy to follow format allowed me to follow along with the process from start to finish with no difficulties. I know my Blade 400's swashplate is setup better then it ever has been. I built that leveling tool and it works so well, but it was hard for me to confirm the heli was level so think I will get one of those Trueblood tools you mentioned. Too bad you don't sell those with the book - you would make a small fortune I think. Thanks again for making this info available for such a low cost. John, Wanted to let you know what a great help this swashplate setup book of yours has been. I thought I had a fairly good understanding of swashplate setup, but I do admit I was always messing around with servo interaction and followed the old hit & miss, trial & error method of getting the interactions figured out. I knew there had to be a better way and after searching the internet high and low, found your e-book. Your logical approach took the guesswork out of it. I can't imagine how much time I would have saved if I knew your "little secret". Keep up the good work.